Josh Lucas short layered hair. One trait shared by almost all men is a desire to look their best when they go out in public. This is true whether they’re going out for work or play. One of the features men spend a great deal of time on is getting their hairstyle just right. However, this becomes more difficult for men with thinning hair and a receding hairline. Still, there are some hairstyles for men with a very high hairline. With this in mind, some of the best haircuts for men with a very high hairline include a traditional crew cut, a buzz, a flat top, and in some cases a Caesar. The other easy way to cut and styled hair is to have the hair cut in layers. It is usually best to start with a shortcut on the sides and back layering into a longer length on top. For those who tend to be a little more rebellious, two options are a spiky and a faux hawk. 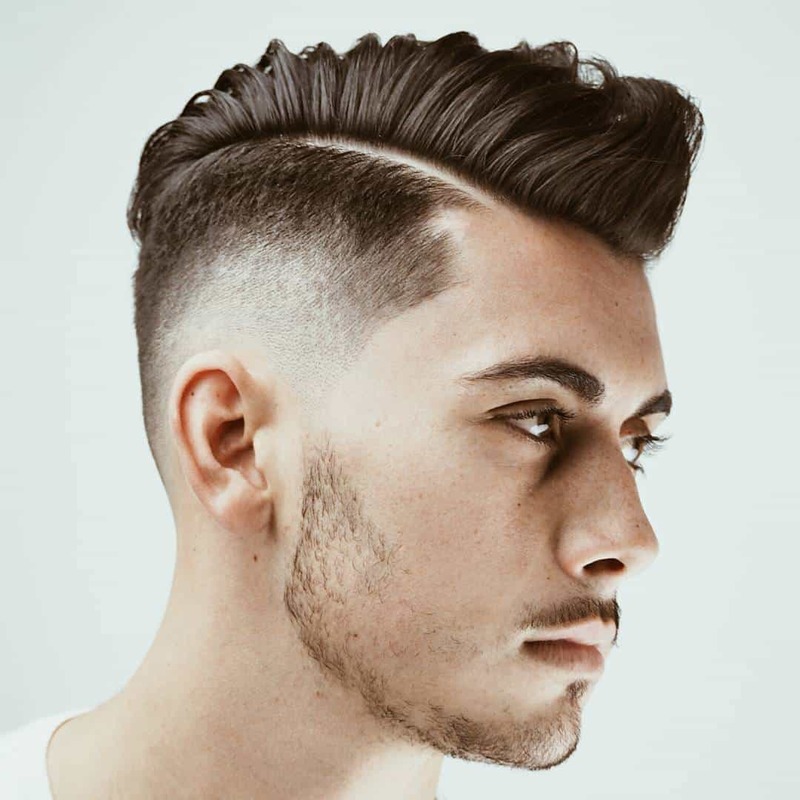 The faux hawk style is achieved by having the haircut short on the sides and leaving a strip of longer hair in the center at the top. This particular style is good for men with receding temples. Thinning hair and receding hairlines are an unfortunate fact of life for many men. It becomes necessary to change the hairstyle one wears as the hairline moves farther up and back. One point to remember when choosing hairstyles for men with very high hairlines is that keeping the hair shorter is often more attractive than trying to grow it longer. Visit here to see pictures gallery of hairstyles for men with receding hairline. I don't know where it became conventional wisdom that Clooney has a receding hairline, but he doesn't. That dude's hair is so thick there are parts of his scalp that hasn't seen daylight since Nixon was in the White House. Actually Clooney does have a receding hairline… You are falling for the illusion….. This is why I recommend older men to get the caesar cut…. the feather-ish bangs distort actual hairline thus the actual idea of a receding hairline is replaced by the fact that hair is their……… It works well for him as well.. His sandy-white hair is not going to stand out against his lightly tanned skin,,, Very hansom man. Now if you are a White skin colored male with brunet hair.. you may want to get either of the two hair styles but also bleach your hair… The lighter the hair, the least obvious the receding looks… Also the gene linked to brunet hair is also generally linked to the gene that makes hair straight… Notice most blondes have shaggy-ish hair… The is also a problem… And it makes sense when looking at what men bald the most often… and which men feel it damages their self esteem… The brunet white male…. Because of the color contrasts between his hair and skin and also because straight hair allows the body’s natural oils to not only coat it. but also down onto the face and across the entire head…. this is why the more advanced your balding is, the more oily and soft your hair because.. excess oil production begins piling more onto your head and face rather then the missing hair … The oil is catastrophic as it will also eat away at your hair follicles and sit their as food for bacteria to also infect the the skin…. thus with all of this going on.. your body treats the hair as s intruder and thus the inflammation occurs…. All this plus the original reason you are balding-DHT will definitively destroy your hair..
Now if you have more then just receding, you should just shave it all off… trust me… men look better cleaner rather then trying to look younger with the few follicles they have..
Im 46 and I shaved my head for the first time in years. I like the look of some stubble the best, and it seems that most men with a little stubble keep their beard the same. How do I maintain the stubble look on my head and beard? And if I change my mind and go completely shaven what product do you recommend? Will any of these products make me lose more hair if I use them on my scalp? You mentioned oil…..
And if I go back to longer hair, Caesar cut and two other styles… what are the two other styles? I am a white male with dark brown hair… you also mentioned bleaching your hair…. will this damaged my all ready thinning hair?